What Is an Invisible Zipper? An invisible zipper is a zipper that is hidden within a seam. The only part of the zipper that is seen is a slender zipper pull at the top. An invisible zipper is not sewn in the same manner that regular zippers are sewn in. With an invisible zipper, there is no worry about straight topstitching on the finished zipper. An invisible zipper that is a close match to the fabric you are using. Read the instructions that accompany your invisible zipper and zipper foot and prepare the zipper. Your first step is to open the zipper. 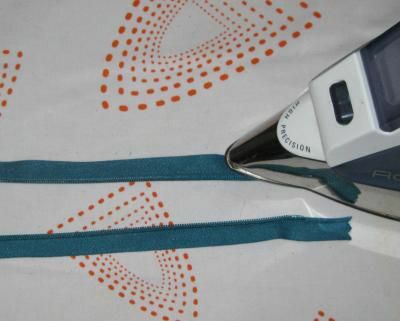 Thoroughly press the zipper tape by laying the open zipper, with the zipper pull side down, on the ironing board. Use the point of the iron to get under the coils and iron the zipper tape flat. If needed, press the fabric where the zipper will be sewn into the seam. Lay the zipper face down (zipper pull side down) on the right side of the fabric. Bring the zipper tape into the area where you will be sewing in the zipper. Measure the seam allowance from the edge of the fabric to the zipper coil. Your goal is for the seam allowance to stay consistent with the pattern and the length of the zipper. Pin the zipper tape in place, removing the pins as you sew (do not sew over the pins). If you are not comfortable removing pins as you sew, take the time to hand baste the zipper tape into position. Set up your sewing machine with your invisible or concealed zipper foot. Using the hand wheel, gently bring the sewing machine needle down to confirm that your needle will clear the presser foot. Place the zipper coil under the zipper foot so that the stitching will be right next to the zipper coil on the zipper tape. Sew the entire length of the zipper in place, removing the pins as you come to them, without sewing over them. Lay the zipper (pull side down) on the right side of the fabric edge that will create the finished seam. Measure and pin in place just as you did for the first side of the zipper. Return to the sewing machine and sew in the second side of the zipper tape, the same way you did the first side. Note: If you have a seam that will intersect the seam that holds the invisible zipper, be sure to match the seams. Match the stitching of sewn sides of the zipper, the same way you would line up seams to have a seam line match. Pin or baste the matched seams in place. Place the regular zipper foot on your sewing machine. Place the fabric under the presser foot and align the needle with the stitching at the bottom of the invisible zipper. Sew the seam line until you clear the invisible zipper. Place a regular foot on your sewing machine and finish the seam. Choose a seam finish to complete your zipper installation. Using the seam finish you have chosen, sew the seam allowances of the entire seam, under the zipper and below the zipper, to prevent fraying threads that can jam in a zipper and weaken your seam.